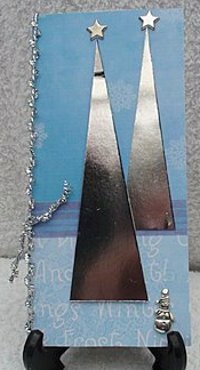 Xmas Tree Cards, made from triangles. Try these Xmas Tree Cards. More super easy ideas for using Triangles and ideal for using up your scraps as it takes very little to make them. If you want to make a card in a hurry and your "stash" is on the lean side, then what could be more simple than these lovely cards. They are made very simply by cutting out a long triangle from some pretty paper and then Matted and Layered onto some silver mirror card. The base to the card is some white Glitter Card. to represent the snow and I have added Peel Offs along the edges. Add some Sparkle to the trees with a Quickie glue pen and some Glamour Dust. Your trees can be any colour you want them to be. You don't need to stick with Traditional Christmas colours of reds and greens. You can make them funky in pinks and blues. Glue on some star shaped Gemstones to the top of the tree for added sparkle then attach them to the card with foam pads, or silicone glue to raise them up. 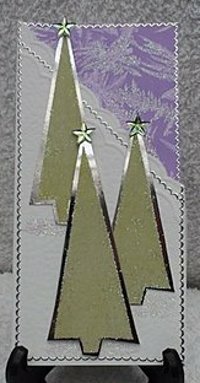 The spine to this card has been wrapped in silver tinsel and a silver snowman Charm has been added to the bottom with a matching brad. This is an easy way for new beginners to make some trees in a quick and simple way but If you are lucky enough to have some dies then you can cut out lots and dress them up anyway you wish.